There are two main methods of auto transport from which to choose from when working with San Antonio Car transport. These two options are Open Car Transport and Enclosed Car Transport. Open Car Transport is the most common form of auto shipping. First off, it’s cheaper. And secondly, despite its affordability, it’s a perfectly secure way to ship a car. 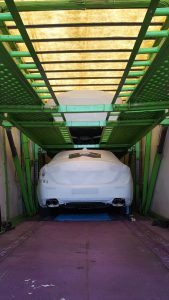 The only real difference between Open and Enclosed Car transport is that your automobile is exposed to weather and dust. Regardless, the car will get there safely and at the same time as one shipped with Enclosed Car transport. We do recommend Enclosed Car shipping if your automobile requires the highest level of protection. This style eliminates the remote possibility of damage due to unpredictable weather and road debris. Whether you select Open or Enclosed car shipping, San Antonio Car Transport will deliver your vehicle safely and professionally. However, if you do have a luxury or exotic vehicle, the best to make is Enclosed Car Transport. By being covered throughout its journey, your car will be guaranteed safe. Rough roads, violent weather, stray debris – none of it will be able to touch your car. With this type of transport, you not only get top-notch protection, but your car is also insured. So, if the unthinkable happens, and your precious car gets damaged, it’ll be fully covered. Enclosed Car transport gives you ultra-protection as well as peace of mind. Contact us today and one of our friendly and knowledgable agents will get you started on all your Enclosed Car Shipping needs!